Here at Feathers, we've now been stocking the Vanguard Endeavour EDs for around 6 months, so I feel well placed to finally review them. Available in 8x32, 8x42 and 10x42, the Endeavour ED are probably Vanguard's flagship binocular, having received plenty of excellent feedback since their introduction. My initial reaction met my high expectation, but as the 8x and 10x42 retail for a shade under £300 (the 8x32s at £30 less), the Endeavour EDs face a lot of competition from similarly priced models; Hawke Frontier ED, Sapphire ED and Opticron Countryman to name but a few. I'm very fond of all of these, each with perhaps an advantage over another, so it has been an interesting few months spending time with the Vanguards. The list of coatings Vanguard apply to their Endeavour ED binoculars is extensive; P2 Phase Coating, V-Max Silver Coating, Anti-reflection Coating and Emerald Coating. Add this on to BAK-4 Prisms, fully-multi coated lenses, nitrogen filled body and ED glass, you've got yourself a rather impressive spec. Testing today as the light drizzle continues to fall, I certainly appreciated the sharpness achieved by the Endeavour EDs, thanks to the phase coating, picking up the crisp edge to the raindrops on the buddleia leaves. The Emerald Coating, which in Vanguard's own words, is specifically designed to provide the full spectrum of colour within the band of green tones, must add something I'm sure, though personally I've never looked through any pair of binos and thought that the greens should look more... green. The V-Max Silver Coating and Anti-reflection Coating are designed to maximise light transmission (similar to Opticron's Oasis Coating and Hawke's dielectric coating), which evidently benefit the optical quality as even when the light fades these binoculars provide a bright image. Our local colony of resident House Sparrows provided a welcome test as they flit back and forth from the feeders to the holly, a good chance to assess the speed and comfort of the focus wheel, as well as the optics. I was very pleased with the contrast between the male Sparrow's dark 'bib' and its pale chest, and equally impressed with the clarity in the fine details such as the yellow gape on a juvenile bird. 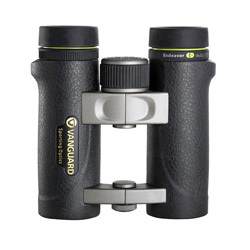 Vanguard certainly don't target nature watchers looking for a wide field of view, as few of the models in their range offer this, but at 7.2°, 7° and 6.5° on the 8x32, 8x42 and 10x42s respectively, I found them decent enough and never like I was looking through a tunnel. In fact, the 6.5° on the 10x42s was quite pleasant and throughout the day would be my preferred choice. Obviously the 8x42s gather a bit extra light in replacement of the extra reach of the 10s, so an advantage for twilight birding. The 8x32s, with the widest field of view, are an ideal option for smaller hands or saving on space/weight. Each model displayed very little purple fringing/chromatic aberration thanks to the ED glass, certainly none in the centre of the view but a fraction at the edges. Speaking of which, sharpness is retained well throughout the field of view, an expected drop off right at the edge but very good overall. A magnesium alloy body covered in well textured rubber armouring provides assurance that these binoculars are well built. The open bridge design is smooth but offers plenty of resistance, so once you've set up the binos to match your IPD (interpupillary distance), there's no chance of them moving themselves out of position. The focus wheel, which I mentioned earlier I assessed with the help of the House Sparrows, turns very smoothly, allowing for easy fine adjustments without being too fiddly. To adjust the dioptre (positioned under the right eye cup), a slight lift up will unlock it and an easy turn on the ribbed rubber gets it set, then just push it back down to lock it again. Simple. A slight contour for your thumbs to rest has been considered thoughtfully, under the barrel of each ocular, and is positioned nicely to create a balanced hold when in use. At 730g, the 8x and 10x42s are about average weight, the 8x32s at 480g offering an appreciably lighter alternative. Should you decide to use any on a tripod (with an adapter), the small Vanguard branded cap on the front bridge unscrews to reveal the socket underneath. The twist-out eyecups function smoothly but perhaps don't lock in each stop as well as a Japanese made binocular (such as the Opticron Countryman) but are certainly comfortable placed up to your eyes. What's in the box? Well, Vanguard are probably best known for their bags, cases and tripods, so as expected the soft case is very high quality, as is the padded lanyard. Each is branded with the Vanguard logo, as are the rainguard (which threads on to the lanyard) and the objective stay on lens caps. A cleaning cloth is packed in with the warranty card and instruction booklet. The warranty itself is a limited lifetime warranty, which I'm led to believe is limited to 10 years within the EU. You can register your product on Vanguard's website where you may qualify for an extended warranty, though I would think 10 years peace of mind is ample. Hopefully you'll never need it, but the company are very friendly should you ever need to send your binoculars back for repair. Nines all round! Superb binoculars, all 3 an ideal option for differing scenarios, offering the user a very comfortable viewing experience. The bright, crisp image is very impressive for the price, especially when on offer, perhaps lacking ever so slightly in the field of view department. Made in China rather than Japan to keep the cost down, not noticeable in everyday use but just enough to pick at. You may want to buy a better cleaning cloth at some point, but the case and lanyard are above par. 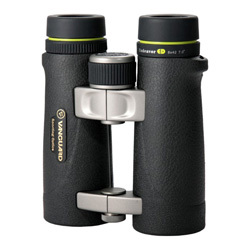 A serious contender when looking for bird watching or general nature watching binoculars under £300.